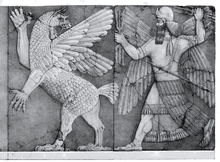 Marduk, sun god of Babylon, with his thunderbolts pursues Anzu after Anzu stole the Tablets of Destiny. ↑ Jastrow, Jr., Morris (1911). 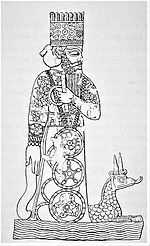 Aspects of Religious Belief and Practice in Babylonia and Assyria, G.P. Putnam's Sons: New York and London. pp. 217-219.